Our fully equipped, air-conditioned gym offers a range of fitness equipment for everyone. 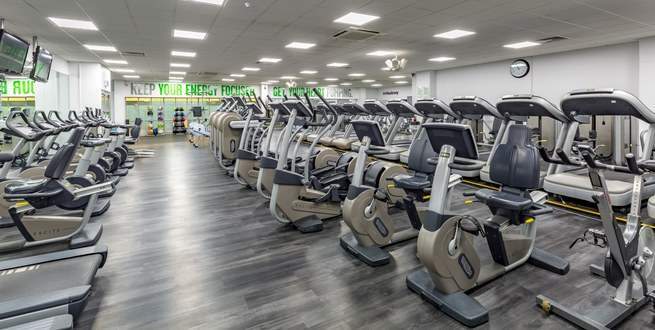 Our members can choose from cardiovascular machines such as treadmills and rowers, to resistance equipment, free weights, dedicated stretching areas and fitness aids such as Swiss balls. A large Leisure Pool with features including a slide and wave machine. Pool depth ranges from 0.0m - 1.7m. Please note this is not a lane swimming pool. A Teaching Pool used solely for lessons. The Sports Hall is a multi-sport arena featuring 6 badminton courts, 2 football courts, 2 basketball courts and 2 volleyball courts. The area is also suitable for badminton, table tennis, trampolining, gymnastics and Birthday Parties. There are 4 squash courts available at the centre, complete with a viewing balcony. The courts are in demand so please book courts in advance (up to 6 days ahead) to secure your game. Climbing is fantastic fun and the perfect way to get an all-round workout. If you are an experienced climber then this wall is for you. Challenging and low level with testing traversing routes, this local wall can give anybody the workout they need. Unforunately at this time there is no provision for beginners and rope climbs however for those looking for a challenge, please visit the centre and speak to our dedicated instructor.